30,000 printed, distributed in over 300 locations in 28 counties in central East Tennessee. All images must have a pixel resolution of at least 300 dpi. Ads must be submitted digitally in CMYK color. Standard ads must be submitted with no crops or bleed. Premium ads are 7.5” x 10” no bleed, or 8.5” x 11” with bleed. Please provide crops and 1/4” bleed on bleed artwork. We accept the following file types: EPS, TIF, or high quality PDF. Microsoft Word and Publisher (.doc, .docx) files are not accepted. Ad design services are available. $100 per ad with 2 revisions. Some restrictions apply. Contact us for more info. Contract deadline is February 22, 2019. Artwork will be due by March 4, 2019. Payment due upon receipt of artwork. 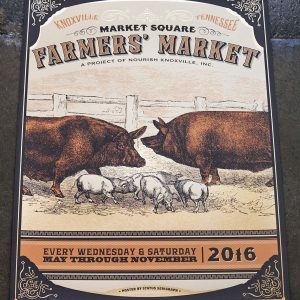 The 2019 Local Food Guide will be delivered to Nourish Knoxville in mid April. If you would like bulk copies for your location, just let us know!